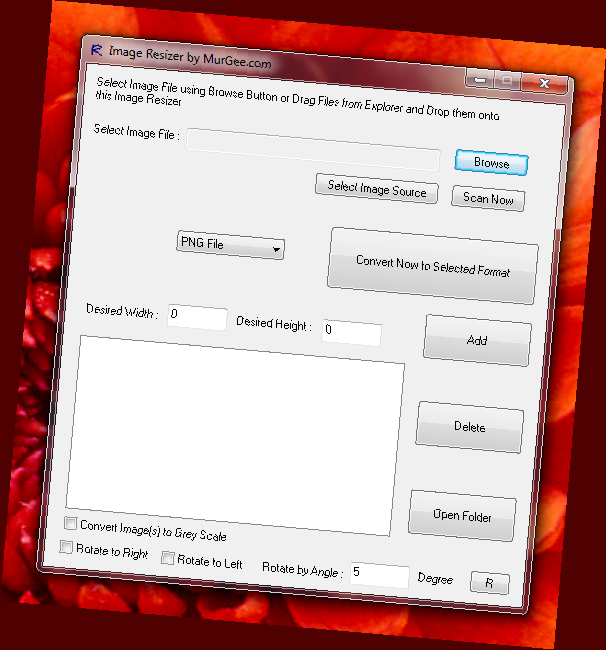 Another useful feature of the Image Resizer Software is to rotate single or multiple images easily and quickly. There are many options available in the software to rotate single or multiple images. You can either opt to rotate single or multiple images to the right or left and you can also define an angle at which the Image Resizer must rotate the images. As displayed below the Screenshot of the Image Resizer was rotated by 5 degrees and output image file type was selected as png. As you will notice the above image is rotated using the software. Note that the Image Resizer automatically took the appropriate background of the new image which if required can be changed using any image editor. Rotating Multiple Images on a Windows Computer with a small software download can really save your time and efforts. Yes the output image you get depends more or less on the image you want to rotate and the angle at which you want the images to be rotated. Multiple Images to be rotated in a batch at once can be of any type including .bmp, .jpg, .jpeg, .png or almost any other image type found on Windows. Before dropping multiple images onto the Image Resizer, you would have to specify the output image file format (which can be any of the .jpg, .png or gif file types). Download free trial of the Image Resizer now and give it a try with your images. There are no reminders or popups in the software to ask for registration key or serial number. The trial version is just usage limited version and will work as good as full version untill the free trial usages of the software have been completed. The Image Resizer can be used on Windows 8, Windows 7, Vista or even on Windows XP and it will work good.